Due to inclement weather, we have postponed our M&SCA Golf Classic to September 24, 2018. 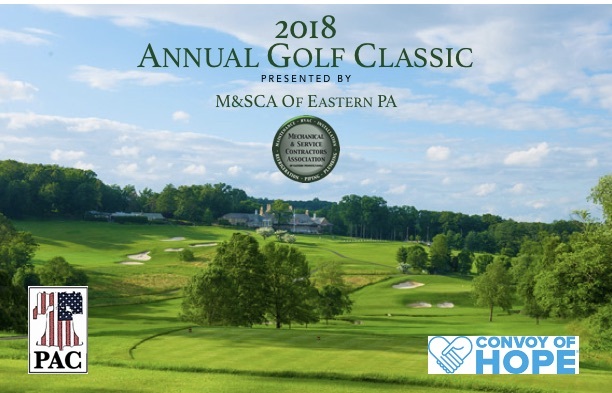 M&SCA will once again be hosting its annual Golf Classic at the beautiful Huntingdon Valley Country Club. Please plan to join us for a fun-filled day of good golf, company, food, and prizes as we raise money for two worthwhile entities: The M&SCA PAC Fund and the M&SCA Convoy of Hope '19 Event. Thank you to all of our supporters. Our 2018 Golf Classic is sold out please see the Fees and Sponsorships tab below for available Sponsorships. Huntingdon Valley Country Club is home to 27 holes of championship golf designed by famous golf course architect William Flynn. Play began in April of 1928. The club has a storied history of great Suburban League golf teams and a list of accomplished golfers none more prominent than the late Bill Hyndman III. The golf operation has all of the amenities of a high-end country club including a fully stocked golf shop, practice range, and short game facility, bag storage, locker room, and more. The professional staff is happy to help you with individual and group instruction and the tournament program offers full schedules for men, women, and juniors. The course is also a frequent host to local, regional, and national events such as the Philadelphia Open and Amateur, and the AJGA Philadelphia Open. All Sponsorships are now closed. Convoy of Hope was founded in 1994 by the Donaldson family. Their inspiration for starting the organization can be traced back to the many people who helped their family after their father, Harold, was killed by a drunk driver in 1969. Today, more than 100 million people have been served throughout the world by Convoy of Hope. We are proud that we work through churches, businesses, government agencies and other nonprofits to provide help and hope to those who are impoverished, hungry and hurting.